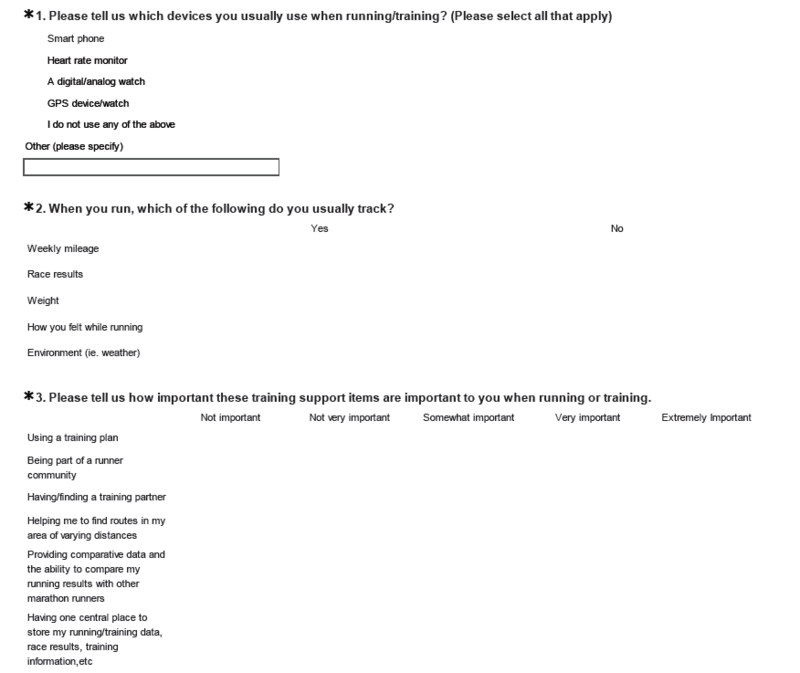 Few days ago I completed a survey from one of the sponsors of the 2014 New York Marathon, which I will run on November 2nd. I found the survey interesting and positive as it made me reflect on some topics which I would possibly would not have deemed very important to running. See some of the questions below and reflect on them in relation to your running habits. How important these training support items are important to me when running or training? Using a training plan: Extremely important. Very often is essential to find the courage to go out and run, especially when the weather conditions are not the best. It is also very important to push yourself, go for the last series repeat, etc. Being part of a runner community: I initially thought this was not very important. False. It is. Being able to discuss with friends how you are evolving, how you felt at races, taking part together in races, etc., also makes it much better. Having/finding a training partner: I also thought that this was not important as most of the time I run alone. Nevertheless, when I have the opportunity to run in Toulouse, Madrid or wherever in Spain with my marathon pals and other friends it makes it so much better. Helping me to find routes in my area of varying distances: Very important. When you have lots of distances already measured, it reduces the thought process of deciding where to go and reduces uncertainty. Providing comparative data and the ability to compare my running results with other marathon runners: the comparison with other runners is not so important to me, but being able to compare my runs with previous ones to sense how I am evolving it is very important. Having one central place to store my running/training data, race results, training information, etc. : again, extremely important.